Package: 1 EAHandy three shelved cabinet stores and displays your items behind a glass door. 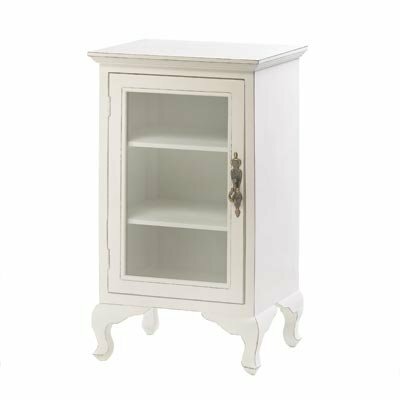 Elegant and simply white with decorative legs and door handle, it will be useful in any room!Weight 12.8 lbs. UPC# 817216010729. 15" x 11 3/8" x 25 1/4" high. MDF and pine wood. Product dimension: 15" x 11.4" x 25.2"
If you have any questions about this product by Home Locomotion, contact us by completing and submitting the form below. If you are looking for a specif part number, please include it with your message.